Daniel Fast Devotional - 21 Days of Tips, Recipes, and Encouragement! 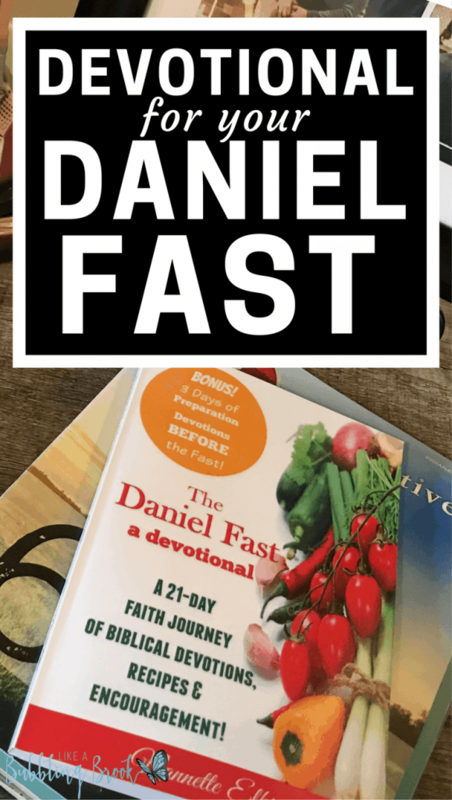 Daniel Fast Devotional – 21 Days of Tips, Recipes, and Encouragement! Done properly, the Daniel Fast can propel your relationship with God. Here’s a Daniel Fast devotional you can utilize during your Daniel Fast! Jaime’s Note: Friends, help me welcome Nannette Elkins, a missionary and the author of the The Daniel Fast: A Devotional. Today, she’s generously sharing a chapter from her book with us… Let’s get started! The Bible tells us that the prophet Daniel fasted on a regular basis. It has even recorded three of those fasts for us to look at and observe. In one of them, he goes completely without any food at all. “And I set my face unto the Lord God, to seek by prayer and supplications, with fasting, and sackcloth, and ashes…” Daniel 9:3 KJV. In the other two fasts that are recorded in the Book of Daniel, he participates in partial fasts where he eats some foods, but restrains himself from others. Each time he fasted, we can find one thing he was very consistent with; he never failed to pray! Look at the verse above again in Daniel 9:3, “…to seek by prayer and supplications.” Even when it doesn’t specifically mention prayer, we know Daniel prayed because he was a Hebrew prophet and a man of God. He would not have fasted without prayer! The Jewish people understood that the two went together. Hannah was another child of God who knew what it was like to fast and pray. Maybe you remember her from the Old Testament book of 1 Samuel. Hannah was married to a wonderful man named Elkanah, who loved her dearly. But Hannah was not his only wife, as was customary in those days. He had another wife, Peninnah, who was not particularly hospitable. Peninnah had children by Elkanah, but Hannah’s womb was barren, and Peninnah loved to boast to (and even torment), poor Hannah about the fact that she was childless! To be unable to have children in that time period was considered almost a disgrace, and the women took it personally, as if God had cursed them. Remember Sarah who tried to take things in her own hands and insisted Abraham take one of her handmaidens in order to have a child? Sarah couldn’t wait and let God bring about the miracle He had promised! Every year Elkanah took his family out of the city to sacrifice and worship the Lord at Shiloh. This time was no different. As usual, on the way, Peninnah was being her contrary and annoying self, tormenting poor Hannah to tears. Hannah would not eat; she was so upset. We are led to believe that she was fasting and when they arrived at the temple she prayed to the Lord, “O Lord of hosts, if thou… wilt give unto thine handmaid a man child, then I will give him unto the Lord all the days of his life, and there shall no razor come upon his head.”1 Samuel 1:11 KJV. Eli, the priest, accused her of being drunk because in her deep anguish, her lips moved but no sound came out. She replied, “No, my lord, I am a woman of a sorrowful spirit: I have drunk neither wine nor strong drink, but have poured out my soul before the Lord.”1 Samuel 1:15 KJV. With that, Eli told her to go her way; her prayer had been answered. And true to His Word, God gave Hannah the desire of her heart. True to Hannah’s word, she gave her son, Samuel, back to the Lord. Yes, Hannah was so upset she couldn’t do anything but fast! Have you ever been so desperate that you just had to fast? You were desperately anxious to go to prayer? Your need was so critical that just saying you were praying wasn’t enough. A bedtime lay-me-down-to-sleep prayer wasn’t going to get it; you had to get down to business. Does that mean we have to work at getting God to answer prayer? No. We are the ones who need the changing, not God. Fasting changes our heart, mind and soul. Fasting clears things up that were muddy before! God can speak to us because we have cleaned things out of our minds. We have taken time to be with Him and pushed some things aside; things that we liked, maybe even loved, that were important to us. We laid them down in order to be with Him. Pray, and fast that you will become like Hannah, Daniel and many others throughout the centuries who were desperate for God to move in their lives. Fasting WITH prayer not only changes situations but it changes YOU! Nannette Elkins has served in various ministry positions, most recently as a pastor’s wife and missionary to Northern Europe serving in the countries of Estonia and Latvia. You can read more about her Daniel Fast devotional book (and purchase it) here.